Why does your pet need a semi-annual examination? Your pet seems fine. He is eating and drinking and playing as usual. Nothing has changed. So why did your veterinarian recommend an examination every 6 months, instead of once a year? And why is blood work needed? Most pets do a good job of staying healthy with minimal intervention so long as they are provided quality nutrition, a safe environment, and a lot of love and affection. With young patients who are not on chronic medications, an annual veterinary examination may be all that is required to ensure that everything is as it seems at home. However, there are some exceptions that make it advisable, or even necessary, to bring your pet in more often. 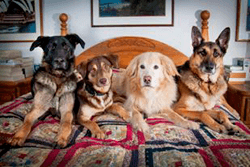 In general, dogs over 8 years of age, and cats 10 years and older, are considered “senior”. This can vary by breed and life expectancy, so it may be different for your pet. As animals age, changes can occur that are not detectable at home. By examining these pets more often, your veterinarian may be able to pick up on subtle changes that occur over time. This older population of patients is at risk of chronic, slowly progressive diseases such as heart disease, thyroid hormone imbalance, kidney dysfunction, diabetes, and even cancer. Through systematic evaluation with a physical examination and lab work, many of these diseases can be discovered in the early stages, when treatment is most successful. Recently, one of our doctors saw a dog for its routine semi-annual visit and uncovered thyroid cancer that was completely curable in its early stages. In addition to senior dogs and cats, any pet that is receiving chronic medications needs an examination every 6 months. Of course, this depends on what medicine is being given. Some drugs have the potential to cause serious side effects, but the benefit from the medicine far outweighs the potential risk. Some examples are anti-seizure drugs, heart medications, diabetes treatments and anti-inflammatory agents. If your veterinarian has prescribed a medication that requires routine lab work every 6 months, there is a reason for it. It is imperative that the directions be followed in administering the medication, as well as complying with the follow-up recommendations. Sometimes the dose of medicine will need to be adjusted over time as the body acclimates to it. Other times, the manufacturer of the drug has established guidelines for safety. For example, a patient at our hospital recently had to change medication because after being on a drug for urinary incontinence for quite awhile, it began to affect her blood pressure. In all cases, your veterinarian will let you know what her recommendation is for your specific pet’s needs. Please keep in mind that we all have your animals well-being in mind and are doing our very best to keep our patients living long and healthy lives.